Many industrially important fungi do not possess a sexual stage and therefore it would appear difficult to achieve recombination in these organisms. However, Pontecorvo et al. (1953) demonstrated that nuclear fusion and gene segregation could take place outside, or in the absence of, the sexual organs. The process was termed the parasexual cycle and has been demonstrated in the imperfect fungi, A. niger and P. chrysogenum, as well as the sexual fungus A. nidulans. In order for parasexual recombination to take place in an imperfect fungus, nuclear fusion must occur between unlike nuclei in the vegetative hyphae of the organism. Thus, recombination may be achieved only in an organism in which at least two different types of nuclei coexist, i.e. a heterokaryon. The heterozygous diploid nucleus resulting from the fusion of the two different haploid nuclei may give rise to a diploid clone and, in rare cases, a diploid nucleus in the clone may undergo an abnormal mitosis resulting in mitotic segregation and the development of recombinant clones which may be either diploid or haploid. Recombinant clones may be detected by their display of recessive characteristics not expressed in the heterokaryon. Analysis of the recombinants normally demonstrates them to be segregant for only one, or a few linked, markers and culture of the segregants results in the development of clones displaying more recessive characters than the initial segregant. 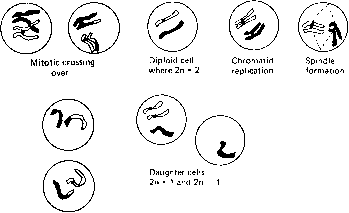 The process of recombination during the growth of the heterozygous diploid may occur in two ways: mitotic crossing over, which results in diploid recombinants, and haploidization, which results in haploid recombinants. Mitotic crossing over is the result of an abnormal mitosis. The normal mitosis of a heterozygous diploid cell is shown in Fig. 3.26. During mitosis, each pair of homologous chromosomes replicate to produce two pairs of chromatids and a chromatid of one pair migrates to a pole of the cell with a chromatid of the other pair. Division of the cell at the equator results in the production of two cells, both of which are heterozygous for all the genes on the chromosome. Mitotic crossing over involves the exchange of distal segments between chromatids of homologous chromosomes as shown in Fig. 3.27. This process may result in the production of daughter nuclei homozygous for a portion of one pair of chromosomes and in the expression of any recessive alleles contained in that portion. Thus, the clone arising from the partial homozygote will be recombinant and further mitotic crossing over in the recombinant will result in the expression of more recessive alleles. Fig. 3.26. Diagrammatic representation of the mitotic division of a eukaryotic cell containing two chromosomes. The nuclear membrane has not been portrayed in the figure. Fig. 3.28. Diagrammatic representation of mitosis involving hap-loidization. Fig. 3.27. Diagrammatic representation of mitosis including mitotic crossing over. other containing 2n - 1 chromosomes. The 2n - 1 nuclei tend towards the haploid state by the progressive random loss of further chromosomes. Thus, the resulting haploid nucleus will contain a random assortment of the homologues of the chromosomes of the organism. 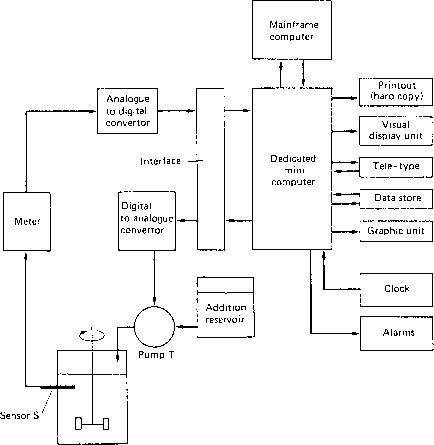 A representation of the process is shown in Fig. 3.28. Therefore, the major components of the parasexual cycle are the establishment of a heterokaryon, vegetative nuclear fusion and mitotic crossing over or hap-loidization resulting in the formation of a recombinant. In practice, the occurrence and detection of these stages may be enhanced by the use of auxotrophic markers. The parents of the cross are made auxotrophic for different requirements and cultured together on minimal medium. The auxotrophs will grow very slightly due to the carry over of their growth requirements from the previous media, but if a heterokaryon is produced, by anastomoses forming between the two parents, then it will grow rapidly. The frequency of vegetative nuclear fusion in the heterokaryon may be enhanced by the use of agents such as camphor vapour or ultraviolet light; mitotic segregation may be enhanced by the use of agents such as X-rays, nitrogen mustard, /;-fluorophenylalanine and ultraviolet light (Sermonti, 1969). desired product. As discussed earlier, auxotrophic mutations have been observed to have quite unpredictable results on the production of some secondary metabolites. Even conidial colour markers have been shown to have deleterious effects on product synthesis (Elander, 1980). Even when suitable markers are available, the induction of heterokaryons in some industrial fungi has been demonstrated to be a difficult process and specialized techniques had to be employed to increase the probabilities of heterokaryon formation (see MacDonald and Holt, 1976). However, the development of protoplast fusion methods in the late 1970s enabled efficient heterokaryon formation to be achieved and removed the major barrier to the application of the parasexual cycle to strain improvement. These developments are considered in more detail in the next section on protoplast fusion. Despite the early difficulties of inducing the parasexual cycle in some industrial fungi it was used in two ways to study these organisms. The cycle was used to investigate the genetics of the producing strains as well as to develop recombinant superior producers. Information obtained on the basic genetics of the industrial fungi using the parasexual cycle included the number of chromosomes (or linkage groups), the allocation of genes, important in product synthesis, to particular chromosomes and the mapping of important genes on a chromosome. Sermonti (1969) and MacDonald and Holt (1976) have described the techniques which were used to achieve these objectives. Initial studies on haploid strains of P. chtysogenum derived from parasexual crosses demonstrated that most of the progeny exhibited the genotype of one of the parents, i.e. no recombination had occurred (MacDonald, 1968). MacDonald suggested that one of the reasons for this lack of success may have been the differences in gross chromosomal morphology between the parents caused by certain mutagens used in the development of the strains. Thus, one precaution to be adopted in the development of strains which may be used in a parasexual cross is the avoidance of mutagens which may cause gross changes in chromosomal morphology. Subsequently, Ball (1978) suggested that the careful choice of markers and the use of strains giving similar titres and being 'not too divergent' may result in achieving more recombinants. Although diploids produced by the parasexual cycle are frequently unstable, stable diploids have been reported to have been used for the industrial production of penicillin. Elander (1967) isolated a diploid from a sister cross of P. chrysogenum which was shown to be a better penicillin producer than the parents and was morphologically more stable (a sister cross is one where the two strains differ only in the markers used to induce the heterokaryon). One explanation of the superior performance of the diploid may have been its resistance to strain degeneration caused by deleterious recessive mutations. Such mutations would only have been expressed in the diploid if both alleles had been modified. Calam et al. (1976) demonstrated that a diploid strain of P. chrysogenum was more stable than haploid mutants and mutation and selection of the diploid gave rise to a diploid strain producing higher levels of penicillin than the parents. Ball (1978) claimed that the usefulness of diploids may only be short term, presumably implying problems of degeneration, and may best be used as stepping stones to a recombinant haploid. The advantages to be gained from the industrial use of parasexual recombinants are not confined to the amalgamation of different yield improving mutations. Equally advantageous would be the introduction of characteristics which would make the process more economic, for example low viscosity, sporulation and the elimination of unwanted products. The development of these issues will be considered in the next section on protoplast fusion.